I watched the professor as he labored in his laboratory that night. My job was to dry his instruments and keep the floors mopped around the flumes. The floors around the flumes seemed to be constantly wet due to the putting in (and taking out) of instruments, paddles, dams, rocks, sand and other paraphernalia. 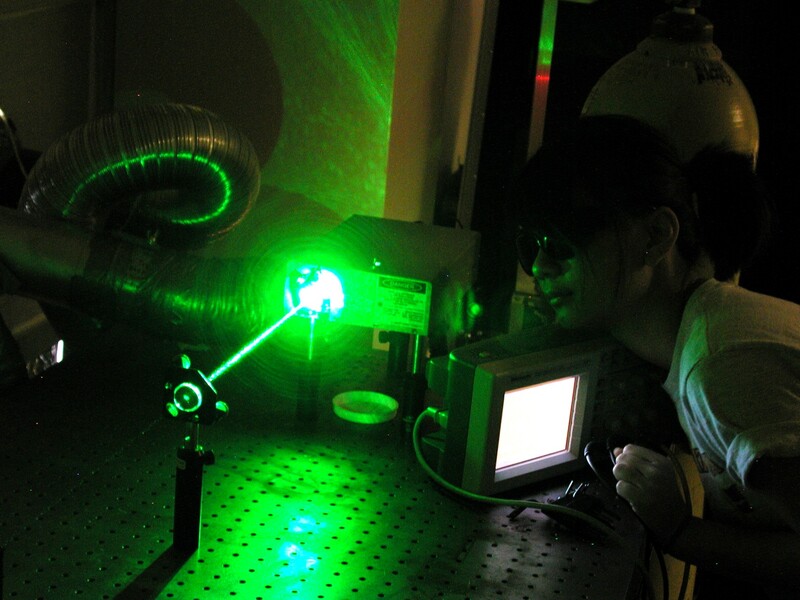 The effects these instruments created were measured by lasers. The lasers were aimed at targets to be hit through variations of water. Water was the medium to be measured. Now water is water and there is not much change between one H2O and another H2O. The professor simply changed the characteristics of flow by using air bubbles, dams, paddles and an occasional blue dye. That night started out the same as most nights. The graduate students had gone home to their cheap flats and the undergrads were in College Town drinking beer. Like every night it was just he and I in the lab. Like every night he gave me a safety lecture about his use of lasers. Believe me; I would not want to be within thirty feet of the target where one of those things was aimed. To me they were a diabolical invention that had terminated the sight of several researchers. No sir. They were not for me and his first lecture on laser safety could have very well been his last. I got the idea immediately. I could not tell you the technical details of what occurred that night. He was working with his laser tool kit. That kit consisted of an aluminum case with two snap locks; each lock additionally had its own combination lock. He had the case open and setting on an old oaken library table. 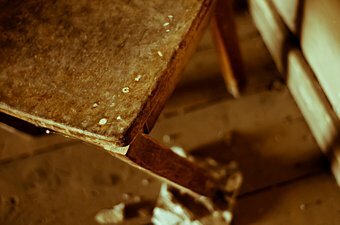 The table was once a gorgeous piece of furniture. It was now a water-stained slab of wood with permanently dried puddles of blue dye (randomly distributed). One leg had been broken and it was now secured together with several over-sized bolts and a hunk of aluminum. The style and condition of this table matched the other oak tables and chairs in the lab. He knew very well when he opened the laser case that I would disappear into the opposite corner of the lab. I did not disappoint him. Finding a padded swivel oak chair (with four legs and only three casters) I carefully sat down. When I was sure that I would not tip over backwards or sideways I settled in for the normal laser show. Water bubbled and paddles made waves in the blue lagoon. The professor appeared to be having trouble with his lasers that night. Several times he stopped his experiments and set up lasers on one mistreated table and his targets on another. There was no medium of H2O between them; except for the damp air that always existed in the laboratory. Several times he connected and disconnected the power supply that drove the lasers. He even swapped cables between the power supply and the laser. Finally he started playing with the computer that controlled the whole mess of spaghetti. An hour or two went by as I sat permanently glued to the broken swivel chair. I felt guilty about not doing anything but I knew he was happy when I stayed put. On the other hand I think that on most evenings he forgot that I was even there (except when he needed my clean-up services). He appeared perplexed and on several occasions sat down, scratched his head, and contemplated the whole set-up. Finally he went out the door (still in his white lab coat so I knew he would be coming back). I had guessed correctly but was quite bemused at what he lugged back into the lab; the battery from his car. He set it on the table with the lasers. Still holding on to the battery handles he gave it a few shakes to ensure that the table would stand the strain of the additional weight. 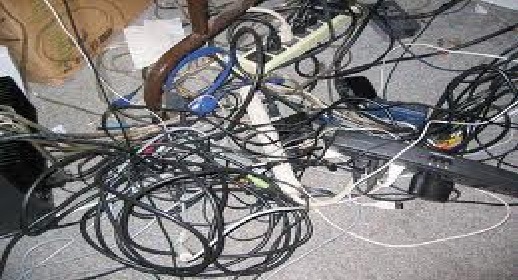 With an apparent new enthusiasm he disconnected several cables and set the power supply to one side. He attached large alligator clips to these lose cables and inserted a single throw switch in between them. Cautiously (and with apparent great forethought) he connected the car battery to the whole conglomeration. All that remained for him to do was to throw the switch. This would connect the new power supply (his car battery) to his laser. He dithered over this situation and diddled with his computer before making the big move. Finally he had enough courage to throw the switch. The computer screen blinked, the hard disc sought the correct application and the laser hummed. Then, on the target, the laser hit the bulls-eye. But something was not right with the test. Instead of a sharply defined red dot on the target there appeared a black dot with a fuzzy rim. It was a transient dot (exemplified by the fact that it disappeared within a few seconds after he opened the switch). He appeared startled. Walking over to the target he gave it a thorough inspection. Nothing appeared amiss and he walked back to the laser set-up. After fumbling with the cables for a few minutes he exercised the computer keyboard. The computer monitor responded to his efforts. Sitting back in his chair he scratched his tousled black hair and mumbled to himself. Satisfied with this verification of his connections and process he again threw the switch. The experiment performed exactly as before and the results (of course) were the same. A black dot appeared on the target and stayed there. However, after opening the switch the black dot took a few seconds to disappear. He performed the experiment for a third time but this time he measured the time it took for the dot to disappear. He was ready to re-perform this timing experiment when a moth landed on the target. Apparently the temptation was too great. He focused the laser on the moth and then threw the switch. The black dot appeared and the moth disappeared. Well, not all of the moth. 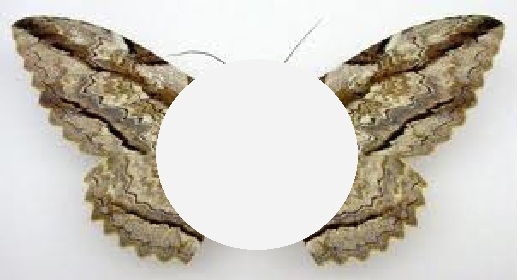 The portion of its wings that were outside of the black dot remained. The partial moth seemed to hang there in mid-air. There was no excitement on the moth’s part. No fluttering, no flying, nothing. That was not the case with the professor. A gasp escaped from his throat. The switch was opened and the black dot disappeared. Much to our surprise the remainder of the moth re-appeared intact. Of course I told him the same thing that I just explained to you. He walked back to his equipment and sat in an oak chair. He said nothing for the longest time. It seemed like hours to me until I checked the clock. It was more like thirty minutes. The professor finally opened his technical notebook and made entries in it. He then rummaged around in a few cabinets until he found a candle and some matches. He set the candle in front of the target. As he did this the moth flew away. The professor contemplated the moth until it attached itself to a wall. He then lit the candle and stepped backward as if admiring his ability to do so. The old oak chair was put to use as he double-checked his settings on the computer. The switch was thrown and the candle was extinguished; or so it appeared to be. When the switch was opened the candle flame was still there. My thoughts may not be valid. However, I believe that the laser (instead of throwing light) was absorbing light. The experiment was conducted several times with as many variations. On one variation he even attached a match to a long rod. He then held the match were the candle flame once was. There was a cracking sound but nothing could be seen. When he pulled the rod back, viola, the match was aflame. All versions of the experiment were recorded with video tape. More writing in the technical notebook occurred. More experiments occurred. The target was moved far away from the laser. The dark penumbra of the activated laser was now much larger. It was also more latticed around the edges. The candle experiment was repeated but the result was quite different. The candle did not re-ignite. The moth was captured and pinned to the target. The laser was excited and the moth disappeared but did not re-appear when the switch was opened. More notebook writing and then he called it a night. I was instructed to lock up the lab; which I did. That night, after a few beers with a friend in College Town we went back to the lab. I had to prove to him what I saw that night. As I was setting up the candle my friend accidentally hit the switch. 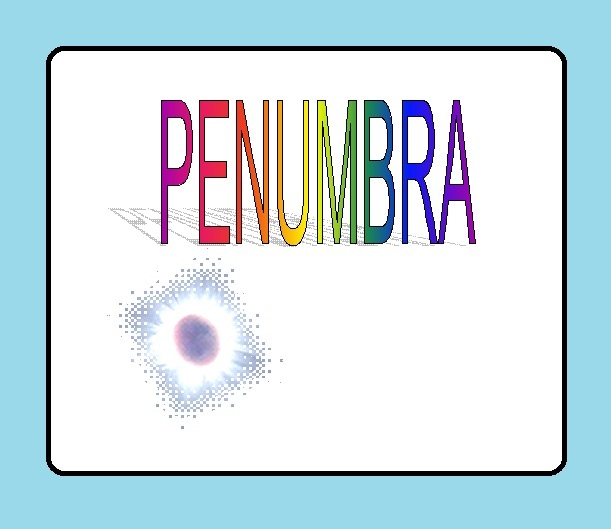 The penumbra enveloped me. I accelerated with to the speed of light while shrinking ever so swiftly. 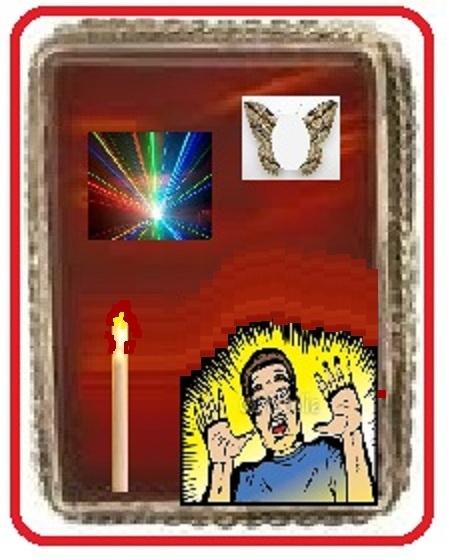 I was pulled into the gem of the laser and found out what had happened to the moth and the candle flame. My friend ran away. The professor returned the next morning and was disturbed to find the door to the lab unlocked. He was irate when he discovered that his laser setup would no longer function. He was mortified when he inspected the laser gem under the microscope and saw me looking back at him with the moth on my shoulder and the candle flame over my head. His solution to the problem was typical of an inept faculty member. He put the gem in his pocket and walked down to the bridge at Cayuga Inlet. Wasting no time he threw the gem into the fast moving stream. I will probably be here longer than the genie that was locked in the oil lamp. The only difference is that I have a moth to keep me company and the flame of the candle for light. Hopefully I will be washed up on the shore near Stewart Park and be discovered by some child. Otherwise the water current may carry me straight into the bottomless depths of Cayuga Lake. If you find me, dear reader, do not rub the gem three times. 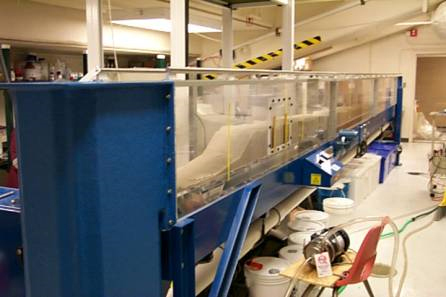 Just take me to the hydraulic lab in Hollister Hall and see if someone can hook me up to some reliable laser equipment. This entry was posted in Farcical and tagged Cayuga, Cornell, Defreeze, Defreeze Lab, faculty, flume, Hollister Hall, laser, power supply. Bookmark the permalink.